We have some new, exciting books that we want to share! Each student has a chance to be the FIRST to check out books that have just arrived. Come in the library, get two slips, fill them out and drop them in the bag of your choosing. We will draw for the first round on Monday, 12/17/2018. Congratulations to our first round of winners! The second round has begun. We will draw on Friday, 12/21/2018 and deliver the books for reading over the break. Congratulations to our two book fair winners – Zane and Addy! Their names were drawn from the students who completed reading challenges in Biblionasium and were able to choose a FREE BOOK from our book fair! Keep your eyes peeled for the next challenge and you could win a book too! 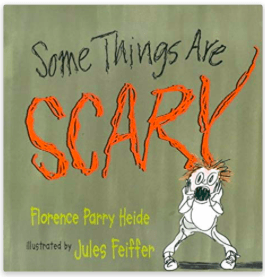 Today with first grade, we read the book Some Things Are Scary by Florence Heide. After we read, we drew pictures on our iPads of things that scare us in the app Doodle Buddy and then for some extra fun, we used the green screen to show off our pictures and how scared we are! We learned lots of things; how to listen to a story and how to use what we know to respond to a story for starters. The students were very excited to see themselves in front of their scary items and the adults had a great time too. Here are some of the fun pictures that we took. Just look how scared everyone is! Our link to our Makerspace Mornings Calendar is attached. We will have one grade level per week come in before school so that each child can work on a bigger project. Makerspace begins at 7:20 and goes until the bell rings at 7:50. Fall break reading – challenge on! Mrs. Dupuis is challenging every student to read 200 minutes during Fall Break. The challenge begins Friday, September 21 at midnight and ends on Sunday, September 30 at 11:59pm. 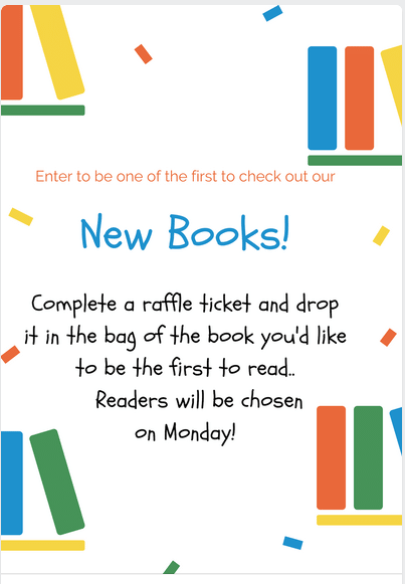 If you complete this challenge by reading at least 200 minutes, we will enter your name to win Book Fair bucks for our Scholastic Book Fair in October! There will be one winner from each grade level. If you read OVER 200 minutes, your name will be enter for each extra 20 minutes of reading you complete. That means if you read for 220 minutes, your name is entered twice. If you read for 240 minutes, you will be entered THREE times! Once for the 200 minute challenge completion, and once for each extra 20 minutes that you read! How will we know that you have read 200 minutes? Mrs. Dupuis will look at Biblionasium on Monday, October 1 to see how much you have read! How do you participate? Go to Biblionasium and log in just like you did for the summer reading challenge. You will need your student number (the one you use to check out books and buy lunch) and your password that you log into the computer with. 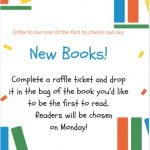 I cannot wait to hear about all the great books you read and give away Book Fair Bucks! During the week of September 4-7, we will have morning Makerspace for 1st grade. Your student will be able to come to the Media Center and make a craft, a video, or code a robot. Watch here for pictures! Our informational meeting will be held on Thursday, August 30 from 2:30-3:15 and is open to ALL interested 4th and 5th graders. Please use the form included here to sign up so that we know to expect you. We will begin Makerspace morning activities on the Tuesday after Labor Day. We are starting something a little different in that each grade level will be coming on a weekly basis. Watch here for the schedule to begin! I am excited to tell you all that Mrs. Gleichweit is joining me in the Media Center. You will see her here, in the computer lab, AND in the STEM lab. She travels all over the place and helps kids and teachers everywhere she goes. Some of you may remember her from Kindergarten and working with older students. If you don’t see me, make sure you ask her for help. She’s always willing! We work together to make sure that our students have what they need to succeed. Can’t wait to see you all!